We’d love your help. 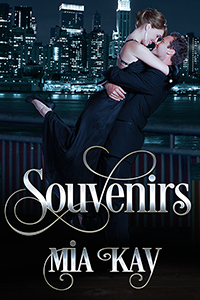 Let us know what’s wrong with this preview of Souvenirs by Mia Kay. Bennett Oliver escapes London for a vacation with his mother. He wants to A reclusive writer . . .
To ask other readers questions about Souvenirs, please sign up. I loved this book. So much so that I read the first 130 pages in one sitting!!! Mia Kay writes characters that are very relatable and real. I enjoyed reading along with the charcters ups and downs. I highly recommend reading this book. You won't regret it! Grace and Ben were meant for each other. This book had all the elements for an awesome love story and I highly recommend it. I really liked Souvenirs by Mia Kay! Beautiful chemistry between her charming characters, Grace and Ben!